SAN ANTONIO (Reuters) - A strong economy and cheap gas have put more motorists on U.S. roads, leading to the worst-ever traffic congestion and forcing the average urban commuter to waste about 42 hours a year stuck in traffic jams, a report released on Wednesday said. The Texas Transportation Institute report estimates U.S. highway congestion costs $160 billion a year, including from lost productivity, gas burned while idling in traffic and additional wear and tear on vehicles. "The higher congestion levels are clearly the downside of increased economic activity," said Bill Eisele, senior researcher for the TTI, which put together the annual Urban Mobility Scorecard along with traffic tracking company INRIX. TTI is part of Texas A&M University. Eisele said Americans drove a record number of miles in the last 12 months, surpassing the previous peak set in 2007, before the start of the massive economic downturn. "Congestion is mirroring the national trend," he said. In 1982, motorists spent an average of 16 hours a year sitting in traffic jams, by 2010, that time had grown to 38 hours, TTI said. 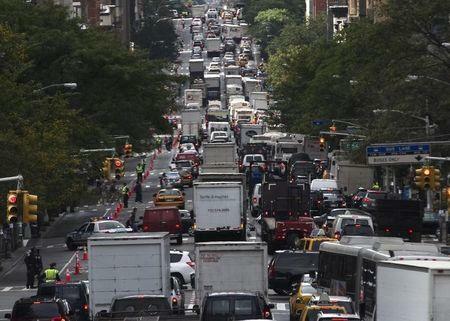 Tim Lomax, a report co-author, said Washington, D.C., has the worst gridlock in the country, with commuters wasting 82 hours a year stuck in traffic, nearly twice the national average. The other most congestion-plagued cities include Los Angeles, San Francisco, New York and San Jose. Six of the country's 10 most congested stretches of highway are in metro Los Angeles, with two each in Chicago and New York City. The "worst" highway in the country is US 101 in the San Fernando Valley area of Los Angeles. During the rush hour, it can take 91 minutes to travel 26 miles (42 km) on the 101, at an average speed of 17 mph (27 kph), it said. "Our growing traffic problem is too massive for any one entity to handle," Lomax said. "Businesses can give their employees more flexibility in where, when and how they work, individual workers can adjust their commuting patterns, and we can have better thinking when it comes to long-term land use planning." Eisele said big-city level traffic congestion is trickling down to smaller metro areas. "Nationwide, the average travel delay per commuter is more than twice what it was in 1982," he said. "For cities of less than 500,000 people, the problem is four times worse than in 1982."